The new Raystar 125 Plus is not only a Compact and accurate Marine GPS antenna but with the new features, compatibility with SeaTalkng protocols, it adds networking capabilities and even easier installation to Raymarine's multifanction displays or in any case that an external antenna is needed. 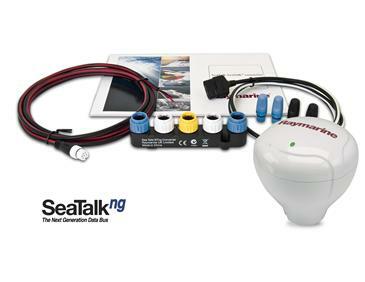 Raystar 125 Plus is fully compatible with Raymarine's SeaTalk 1 and NMEA0183 connectivity and with the converter kit that is included it can interfaces with any device that supports SeaTalkng network. Raystar 125 Plus can output SeaTalkng, SeaTalk1 or NMEA0183 so it can be combined with Raymarine's Instruments data and autopilots as well as with multifunction displays like C-Series and E-Series. Raystar 125 Plus is a very accurate Differential marine GPS Receiver decoding correction signals from WAAS (Wide Area Augmentation System) and delivers accuracy that is better then 3 meters. The Raystar 125 Plus comes with a 10 meter (33') interconnect cable, pole mounting kit, flush mounting kit and instruction manual and a SeaTalk1 to SeaTalkng Converter Kit. Mounting methods flush/pole/rail Pole mount thread: 1" x 14 TPI. This is the standard thread found on VHF radio antenna mounts and extenstion poles. Protocols supported SeaTalk ng, SeaTalk 1 or NMEA 0183 (v2.3) User configured during installation. Click the button below to add the Raymarine RayStar125 PLUS Marine GPS Antenna Stng/Nmea0183 Sensor to your wish list.